I think most users would agree that entering new events in iCal has always been clumsy and the Snow Leopard update just made it clumsier. I mentioned in a post last week that BusyCal’s entry method was distinctly better, although overall, BusyCal wasn’t enough of an improvement to get me to switch. In the past, I’ve used TextMate to create files using a simple pipe-separated format for the events; these are converted through a TM command into iCalendar files, which can be dragged to iCal to add the events. 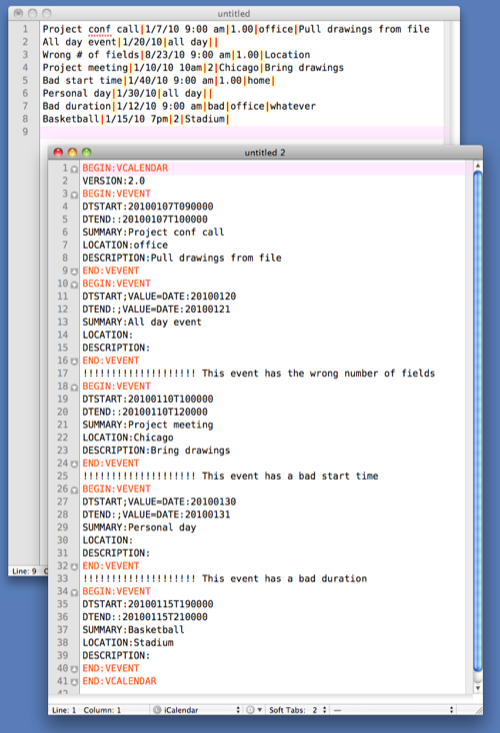 I’ve now improved that command and made a TextMate bundle for generating calendar events. double-clicking it, which should do the copying for you. Although it’s not necessary, it would help if you also install my fork of the iCalendar bundle. This adds just one feature to the standard iCalendar bundle: it recognizes the file type based on a first line of BEGIN:VCALENDAR. This makes saving the generated iCalendar file with the proper extension a little bit easier. The event name, which is the top line in the usual iCal event bubble. The event’s starting time, which is both a date and time. There are three TextMate tab stops within this field: one for the month and day, one for the year, and one for the time. The date parts default to the current date, and the time defaults to 9:00 am. The event’s duration in hours, which defaults to 1. Any other notes you may want to describe the event. 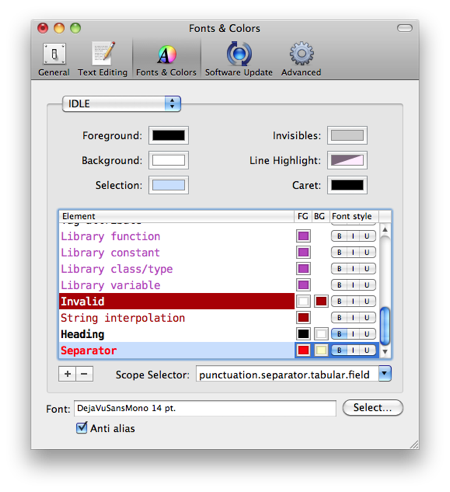 The location and notes fields may be blank, but the pipe characters between them must be present. There is no time associated with the start of the event and therefore only two tab stops in this field. The duration is set to “all day” and is skipped over when tabbing through the snippet. The other three fields are the same as before. Because I have my iCalendar bundle installed, the generated document is automatically recognized as an iCalendar file and is syntax-highlighted appropriately. When I save it, the .ics extension will be present by default. If you don’t have my iCalendar bundle, TextMate won’t recognize it as an iCalendar file and you’ll have to change the extension from whatever your default is (probably .txt). You’ll also notice that the pipe characters are colored in my Events document. That’s because I added an entry for tabular separators to the theme (IDLE) that I use. This highlighting will also work for CSV and TSV files if you have the Tabular bundle installed. If you want special highlighting for the field separators, just add a line with a scope of punctuation.separator.tabular.field to the theme you use. The highlighting isn’t a requirement; the snippets and command will work without it. The Make ICS command uses the parse function from Python’s datetime the dateutil module to interpret the date and time in the second field. This is a fairly forgiving function; you don’t need to include leading zeros, and as you can see from the example above, even something like “7pm” is interpreted correctly. Upgrade to Leopard or Snow Leopard, i.e., get with the program. Look, my home computer is an iBook that came with Jaguar, and it’s perfectly happy with Leopard—I’d have upgraded it to Snow Leopard if it weren’t Intel-only. There’s no reason for you to be that far behind. Download dateutils from Labix and install it according to their directions. Just don’t bother with the Calendar Events bundle at all. I deliberately added errors to three lines in the Events document so you can see how they are handled. The position of the error messages in the iCalendar document will tell you which lines need to be fixed. After saving the iCalendar document, you can drag it onto one of the calendar names in iCal to get all the events added to that calendar. iCal won’t accept a file with formatting errors, so if you forget to make the necessary corrections, iCal will tell you. Is this faster than iCal’s normal entry method? Certainly not if you’re just adding one or two events. But if you need to add several events, especially when the events span several weeks or months, it’s much faster. I also find that I make fewer errors because I don’t get frustrated with all the keystrokes and/or mouse clicks iCal demands.